The handwritten note still has a place in B2B marketing. Is it time for High Tech High Touch Marketing? There’s no question that technology has added a tremendous amount of value to the world of marketing. It’s given us the ability to analyze and decipher various metrics necessary to determine the effectiveness of our marketing efforts. But for some, high tech tools may have, in fact, taken all of the personalization out of the experience. With all the technology we use in marketing today, some say there’s no place for high touch tools like the handwritten note. While it might be old school, it certainly does still have a place in the modern day B2B marketing plan for 3 specific reasons. 1.Differentiation. Using a personalized tool like the handwritten note does set you apart from the competition. It’s rare today to get a personalized message in the mail and when we do, we’re typically surprised and delighted. Just think about your own reaction the last time you received something similar. Take a few minutes to write out your note and make yourself memorable. 2. Online to Offline. With most B2B businesses, you’re talking about long sales cycles and some element of customization, so it’s unlikely you’ll ever close the deal unless you take the prospect offline. The handwritten note gives you the perfect opportunity to take control of the situation. It’s a great way to touch base without even mentioning the deal at stake, yet keeping yourself top of mind so they don’t forget about you. 3.Cost-effective. Finally, it’s one of the most cost-effective marketing tools possible. It’s the cost of the card or notepaper, stamp, and your time. And in most cases, writing the note won’t take a but a few minutes–10 minutes tops if you’re stuck on what to write. And there are many cases in which the note card has helped to progress the deal and even close it. 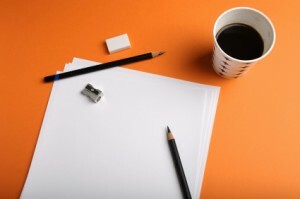 The handwritten note has tremendous value in building a high tech / high touch marketing plan. And in most B2B situations, it’s unlikely anyone is going to write you a check or a purchase order until you take the relationship off-line. You can find more information on this topic, in a recent podcast interview I did with the American Marketing Association.